Produktinformationen "Rainer E. Zimmermann: Metaphysics of Emergence. Part 1: On the Foundations of Systems"
In fact, the theory of (emergent complex) systems as a recently more forthcoming (and somewhat reformed) discipline in its own right has been object of acute and intensive discussion and of a rather dynamical evolution, respectively, for quite some while. Unfortunately, this still ongoing discussion has not been very successful so far as to clarifying the most elementary and fundamental issues of definition and the consequences derived there-from. This is mainly because the otherwise welcome interdisciplinary discourse has been dominated originally by protagonists from the fields of economics, management, and the social sciences, in the first place, rather than by those of the more formalized sciences such as physics. However, the degree of universality of a theory is likely to increase with its connectivity to mathematics. Hence, in order to obtain a self-consistent theory of systems that displays a sufficient coherence with a view to its respective lexicology, syntax, and semantics, it is necessary to perform an explicit embedding into available formalisms of mathematical type such that its specific contextuality can be immediately reflected within the given frame of what is already known about the structure and evolution of nature. This motivation underlies this present project which can be understood as a survey on systems in terms of a suitable metaphysics of emergence. The mathematically based explication of systems is the first step (and thus constitutes the first volume) of a panoramatic approach to what we euphemistically call the world. But we shall bear in mind what the important point is after all: To look for the possibilities of grasping experience whilst recognizing that experience is always more than what can be said about it. Rainer E. Zimmermann studierte von 1971-1975 Physik und Mathematik an der TU and FU Berlin, erwarb 1974 sein Diploma am Imperial College in Mathematischer Physik, 1975 sein Diplom in Theoretischer Physik an der FU Berlin, promovierte 1977 in Mathematik an der FU Berlin. Es folgten 1982-1988 Studien in Philosophie, Geschichte und Literatur und 1988 seine zweite Promotion als Philosoph an der TU Berlin. Seit 1995 hat er eine Professur für Philosophie an der UAS München, 1998 folge die Habilitation. In 1999/2000 war er Visiting Scholar at the History and Philosophy of Science Department und Visiting Fellow of Clare Hall, beide in Cambridge (UK), und ist seitdem Life Member of Clare Hall. Seit 2003 ist er an verschiedenen Universitäten in Europa (z.B. Bologna, Salzburg, TU Berlin, Wien), Mitherausgeber von Fachzeitschriften und Mitglied der Leibniz Sozietät, Berlin. Er hat bisher ca. 350 Texte veröffentlicht, darunter 25 Bücher. Weiterführende Links zu "Rainer E. Zimmermann: Metaphysics of Emergence. 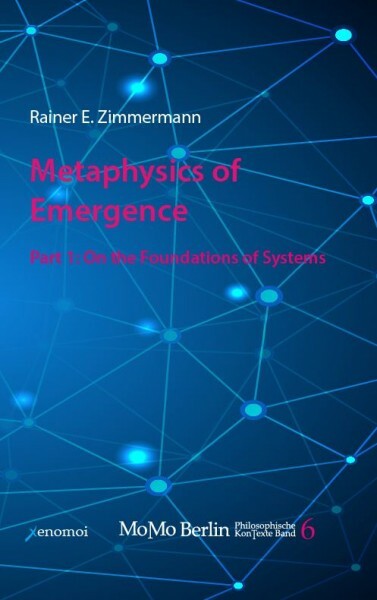 Part 1: On the Foundations of Systems"
Kundenbewertungen für "Rainer E. Zimmermann: Metaphysics of Emergence. Part 1: On the Foundations of Systems"